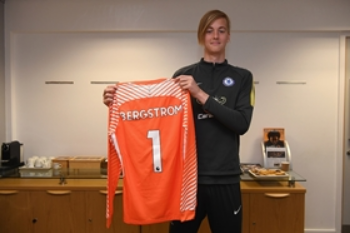 Premier League club Chelsea have bolstered their goalkeeper ranks by signing Finland youth international Lucas Bergström. Finnish Veikkausliiga outfit Turun Palloseura have reported via their official website that TPS goalkeeper Bergström is moving to the Chelsea Youth Academy following a successful trial. The 16-year-old joined the London club at the end of last week after TPS and Chelsea reached an agreement on his transfer. ''This is a very talented goalkeeper, I've known him now for three and a half years,'' TPS goalkeeper coach Eemeli Reponen said. ''Lucas is a modern goalkeeper, that is, good in 1 vs 1 situations. He is at the same time a very comprehensive goalkeeper. According to agent Sami Salonen, who was involved in Bergström's move, several English Premier League clubs were interested in the signature of Bergström but he chose Chelsea.